At least 53 people were killed and several others injured when a packed bus went off a road in the southern Indian state of Telangana. 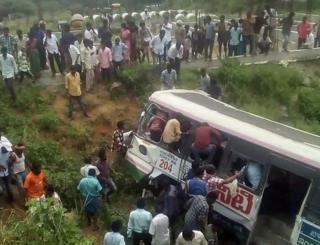 Officials told BBC Telugu the speeding bus veered off the narrow village road after the driver lost control. They added that 86 people were travelling on the bus although it was only meant to take 60. Road accidents are frequent in India, with one taking place every four minutes. The injured have been taken to a nearby hospital. Locals, who rushed to the spot to help with rescue efforts, said people had fallen on each other inside the overcrowded bus. Some of the passengers were Hindu pilgrims on their way to a temple town, which was one of the designated stops. The chief minister of Telangana, K Chandrashekhar Rao, has announced that families of those who died in the accident will each receive 500,000 rupees (about $6,882; £5,287) as compensation. Correspondents say buses in rural India are often old and rickety. Many also do not follow or enforce basic safety measures - it's not uncommon to see people crowding into buses or even travelling on the roof if they cannot find a seat inside. Road accidents in India are usually blamed on badly maintained vehicles, poor driving and the state of the roads.